It was not often that she was frightened these days, but with Luikawa missing she was worried. News of a council of dark wolves arriving, and that Soul Render had come out of wherever he was hiding to join with them had come to her, and that was a bad thing indeed. As she passed through the border to the land, she gave a short howl, knowing Modet at least would recognise her voice. She ran on, searching for her freinds. It was not long though before she caught scent of the gathering of wolves, and hastened in that direction. Trigiadea was out of breath when she finally found Sarabi's rather big pack. The light tan wolf was already looking up, waiting to see who was coming. "Oh thank goodness I found you all." Trigiadea collapsed in an exhausted heap once she came to a stop. She was not hurt, just extremely tired. He, as all the others had, had heard the sound of rapid paw steps, as well as smelt the acrid stench of desperation, with a little tinge of fear. Ryuu sat up immediately from where he had been lounging against a rock on a grassy field with Uru, the both of them simply enjoying the warmth of the day. He flowed to his feet, head tilting in puzzlement, as he glanced at Uru. "Shall we go see what's wrong?" he asked, nodding in the general direction of the howl. 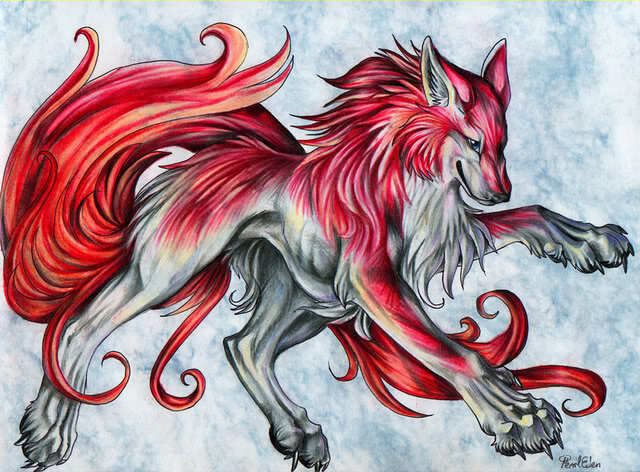 With that, he was off, soon emerging to see a red and white wolf lying panting in the middle of the grassy plain. Ryuu struggled to the stop, plainly startled as he glanced from Sarabi to the newcomer. "Am I interrupting?" he asked tentatively in his accented voice. Sarabi looked over as they came while Trigiadea got her breath back. "Not exactly, though you certainly haven't met my freind here." Uru eyed them. "Nor have I, sister." "This is Trigiadea, Alpha Female of all Wolves, and mate of Luikawa who is the Alpha Male of all wolves," Sarabi said. "Where are Toralon and all of the others?" Trig asked. "I need to speak with all of you." I raced across the wet sand, my paws sinking only a claw's breadth into the soft surface before they were up again, leaving dark paw-prints that the waves would wash away moments later. My mouth was full of my last catch, a fine young fish that had dared come too close to my tail. I came upon the few wolves, and slid to a stop, my feet digging into the sand. The evening sun glinted off the water, throwing everything into a surreal light. Looking at the other four wolves, I almost gasped. The white and red she-wolf that lay on the ground wasn't - couldn't be Trigiadea... I lowered my head in respect, dropping the fish before her. I wasn't hungry enough to give the tired she-wolf some food. She looked completely wiped out, and I could always catch something later. I sat down, my ears flicked up as I waited patiently for her words. Surely, what had brought her here in such a state was exceptionally important. I barely spared a nod to Sarabi, Urur, and Ryuu, so tense was I. I felt a wave of foreboding crash against me, like the waves of the sea crashed against the shore, sweeping a part of the sand back to the water from where it tried to escape. Something bad was happening, and we were slipping into a chaos beyond anything the nation of the wolves had faced before. Trigiadea looked up. "Hello Toralon." She might be hungry but that could wait. "We've got trouble, but are there no more of you here? What of Modet and the others?" Kovu came gliding down swiftly. He inclined his own head. This was not good at all. Soon Anata appeared, she had had a long way to go. "What is going on?" "You know how there is a council of dark horses? Well now there is one here of dark wolves. And I regret to inform you but Soul Render has joined with them and will tell them everything about everyone like us. And with Luikawa missing.."
He could feel it, the anxious cloud of energy that hovered around the small group that was steadily growing larger and larger. These past few days, he had been incredibly uneasy, unable to rest or sit still for a long period of time. His fur, too, was continuously prickling, and, through experience, that usually meant that something bad beyond the definition of 'bad' was going to happen. Ryuu shifted anxiously on his paws, an anxious whine slipping through his throat when, at last, the true horror of the situation was revealed. Thus far, the wolves had, thankfully, evaded war among their own kind. The Dark wolves were too few in numbers to pose any sort of threat. But now... A Council. Ryuu's green eyes filled with worry, as his gaze once more swung to Uru like a magnet, praying that his little family would get out of this unscathed. "But how- where did they come from?" Ryuu asked a little plaintively, voice filled with doubts and worries. The silvery-grey wolf was about to speak once more, when a cold, drawling voice cut across him, causing him to fall silent and stiffen in horrified anticipation. "My, my... have we really stumbled across the War Council of the Light Order? This group of mangy mutts is the best you could come up with?" Veyerni, Leader of the Council of Seven had appeared, his mouth curving up into a grotesque grin. His dual-coloured eyes shone and sparkled with an unholy glee, as they swept the silent group of wolves around them. He could vaguely sense his two Deputies stepping into place, flanking him, as the rest of his Council quickly fell into formation, spreading out in a wide 'v'-shape. The dusky white wolf's eyes then cut across to Ryuu, who had fallen silent in horrified fascination. His mouth twisted up into an unattractive sneer, fangs still stained red with the blood of a recent kill out on full display. "But how- where did they come from?" the white brute mocked in a falsetto voice, earning snickers and chuckles from the rest of the group. "Champions of the light - here in full glory. And all they can do is stammer pathetically and whine like cowards," Sontuire chimed in, prowling forward a little as she gave a mocking smile to the quivering wolf. She bared her teeth at him, using her ability to rack up the terror and fear that the silver-grey wolf was feeling, leaving him whimpering pathetically at their feet. "Good boy," she crooned, smiling manically, moving closer until she was standing over him, then lowering her muzzle to whisper right into his ear. "You should fear us," she hissed, digging her claws into the wolf's prone flank as he struggled under her. "Do yourself a favour and remove yourself from this battle," she advised, before releasing him and stalking back to Veyerni's side. "You'd only be a hazard - for both sides." Rhona echoed the she-wolf's scornful laughter, tossing back her head and crouching down,tail lashing furiously as though she were about to spring. Only Larona and Ulissa, the two oddballs, did not look happy about this new development. They cast timid, apologetic glances towards the Light group, who stood in various degrees of shock. "Why even fight?" Veyerni asked softly, locking gazes with Trigiadea, quickly identifying her as Leader. "Surely, you know that Blood is spilled in battle. You have friends, family, children. Would you really want to risk them all?" he whispered, eyes glinting darkly. 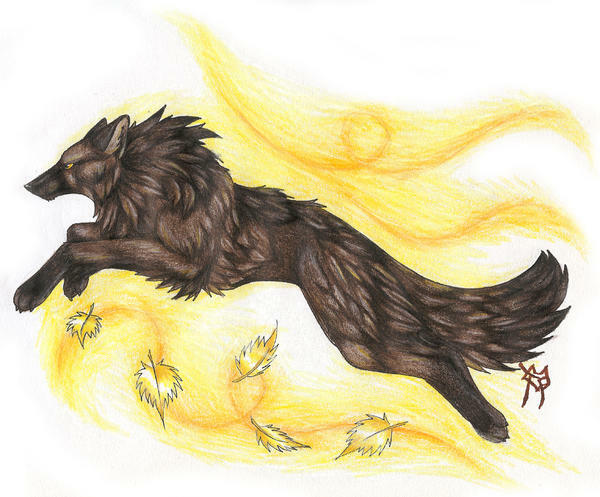 With a twitch of his tail, copies, illusions, of those that the Light wolves loved most dearly lay upon the gassy plain. They lay dead, mangled and ravished to such an extent that their features were hardly recognisable. With another twitch of his white tail, the scent of blood, death... carnage, lay heavily upon the once peaceful air of the land. "Is this what you would risk?" he whispered once more, blazing eyes intent upon the red wolf's. "Risk their deaths? Their loved ones? How long before they all start to hate you for putting them in this position? For leading them into battle that took all they lived for away?" "Could you really live with yourself, then?" As soon as hey came, Trigiadea leapt to her feet, as did Sarabi. Trigiadea snarled. "You have no place here!" She had no thought of stepping down from these wolves. "Why can't we all just live in peace?" Sarabi asked, looking at the dark wolves. "It is not like my family would impede on your territory and cause trouble, so why walk in on mine?" "And why do you dare bring our pups into this?" Anata hissed. If they dared touch her young ones... well they would pay. I saw Nashira lying on the ground, her beautiful fur covered with almost black blood. I growled low in my throat at the illusion, my hackles rising as I stood, my ears pinned flat against my head. These trespassers dared to threaten my pack? They had no idea what they were in for. "You had better leave." I said, between bared teeth. I didn't want to fight here, in Vernien En'Seer, unless I had no other choice. There were too many that could possibly get hurt, and too many who would join in when they were not yet ready for it, my youngest siblings included. I ran up to the gathering of wolves, sniffing with interest the scents of the newcomers. As I approached though, I saw Voyance and Leanbh Chineál, as well as my other siblings on the ground, their hides torn open to reveal bones beneath. Howling with anger, I launched myself at the first of the newcomers, my hackles raised, mouth open. I wanted nothing more than to rip these wolves to shreds, for surely, surely it was them that caused the deaths of my siblings. kovu dodged between Kuvvet at the one he attacked. "It's not real, Kuvvet. No one's been hurt," he said, though he knew the younger one might not listen. "You'll only get hurt if you try and attack them.' And thatw as not something any of them should be foolish enough to do. "Well well well, look who'se finally using his brains," a voice hissed. Soul Render appeared out of nowhere. I stopped short of bowling Kovu over. Barely. My hackles were still up and I growled in fury at the wolves. A dark green and brown wolf moved slowly to me as well, her milky green eyes locking eerily on to the poison wolf's. "Father. You are not welcome here." said the small she-wolf, her voice and manners completely calm. I marveled at my niece's ability to maintain a cool demeanor when faced with such scum. Then again, she couldn't see the ghost images of all the dead loved ones that lay strewn across the sandy ground. I backed away from Kovu slightly, nodding to him as I did so, though my eyes never left the trespassers forms. Beside me, Tirona made a small movement, and the sand around her shifted slightly as well. She was more nervous than she let on, it seemed, and she was just as ready as I was to attack, although she kept it hidden. So, that was her father... I was surprised at the resemblance, really. I had thought perhaps she was entirely different from him, but their green markings were almost the same, though Tirona's were darker. They both had carefully controlled movements, as if they were always ready for anything, and both had unnervingly blank eyes. Tirona was sensing the other wolves through the ground, and small eddies of sand shifted, as if held in an unnoticed wind. She made no sound after she spoke, waiting for some signal she could follow. Her unseeing eyes never left her father, their milky irises glowing slightly with their own light. Veyerni smirked in satisfaction, fur fluffing up as he casually sat on his haunches in a deliberate show of nonchalance. The white sociopath bared his teeth in a pale mockery of a grin, his rumbling growl echoed by the rest of his Council at the warm reception they had received. The brute fair shivered in pleasure at the rest of their reactions - each ranging from horror, to despair, from disbelief, to rage. Lifting a dusky grey paw up to his muzzle, he licked it casually, trusting the rest of his Pack to cover for him and watch his back. The wolf's eyes glinted. They stayed quiet, letting the indignation, fury, pleading and a whole range of others wash over them, like water sliding from an oil-slicked pelt. Veyerni could see the amusement in his Council's eyes, see the hunger for blood, to teach these blood traitors a lesson and put them in their places. It was practically treason, how these self-proclaimed wolves[ dared to name themselves as such, even as they began to become 'domesticated'. Curbing their instincts, staying good and quiet until they were called upon the fight. This was the way of the mutts in the world of humans. Not wolves. Their kind was meant to be fierce and swift, wild and ferocious. Humans feared them for a reason. It was time to remind the world of this. Out of the corner of his eye, Veyerni saw a whirl of fur and heard the furious snarl from one of the new arrivals. 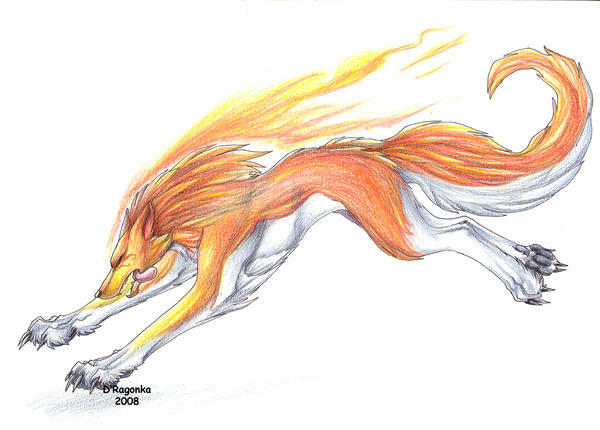 Nuxa and Sonturie slipped easily in front of him, hackles raised and a mad, fearsome light in their eyes. A low growl echoed amongst the group, sizzling and simmering, waiting until the energy could find and outlet to explode. The other four of the Pack spilled forward, flanking him. All of their paws glowed with an eeerie light, the barely-contained power right at the tips of their paws, begging to be released. Veyerni barked harshly, once, and was pleased to see them hold their positions. None of them were to attack. Not yet. His dual-coloured eyes slid smoothly to where the poisonous wolf was standing, and Veyerni growled softly in welcome. "I thought you would come," Veyerni said with a nod, eyes pleased, even as he turned his focus back to the group, ignoring the squabbles and petty fighting that had broken out. 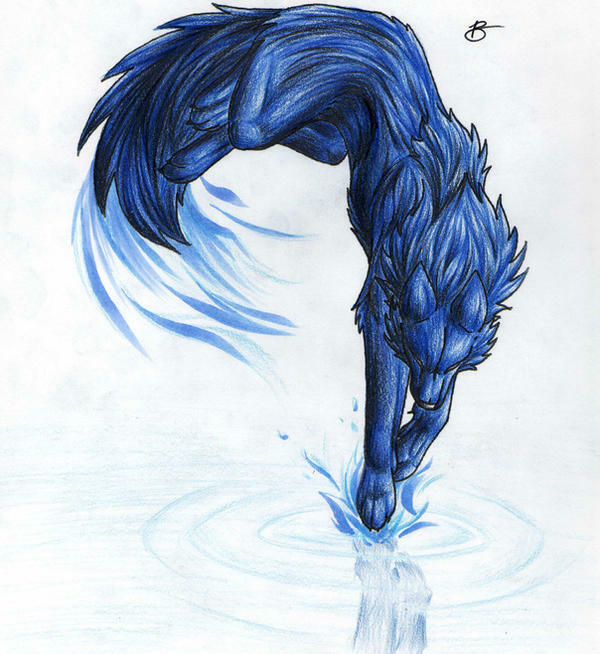 "You-" he started, only to break off when Afira gave a howl of warning, glowing blue eyes fixed upon the strange wolf with the milky irises. His own hackles raised, as he let loose a thunderous growl, a low wind whipping about his paws and tugging at both their pelts in a warning, should they try anything. "Try it. I dare you," he snarled, lightning and parks seemingly crackling around his fluffed fur, as the grey light around his paws brightened to an almost blinding intensity. His claws flexed on the soft ground, and he shifted his weight restlessly, even as the others tightened their little circle around Veyerni. Larona fidgeted uneasily, as she reluctantly summoned her powers as well, breathing in deeply so that the gravity of the Earth had increased by ten times, causing all of them, including the Council, to be rooted to the spot. She ignored the daggers that flew from Afira's eyes, lifting her head up. The only odd coloured wolf of the Pack, Larona's green fur blended in well with the vibrant, emerald grass. "We haven't come to fight," she announced, glancing at her Pack warily, frowning at their grumbles of digust at her words. "We haven't!" she insisted more forcefully, turning her head to look at the Leader of the opposition. "To cut matters short - we have actually come to introduce ourselves formally, and declare ourselves your enemies. Now that we have done that, we'll be off now," she said, keeping her eyes warily fixed on the Light wolves, ignoring the rumbles of amusement and complaints from the rest of her Pack. Still, she did not lift the increased gravitational pull, refining her control of it until she was comfortable. I shifted as the gravity increased, my own powers finding those of the earth wolf of the opposing pack. I shifted my powers in response, letting it slide over me, making myself as comfortable as possible. Whoever this other wolf was, she had a fine-tuned control; as good as my own, if not better. I pushed back slightly on her powers, just a small nudge, really. Curiosity was soaring through my mind at the moment; very few among the wolves were gifted as I was. Still, I didn't attack, taking the wolves at the words of the fae that had spoken. "Try what?" 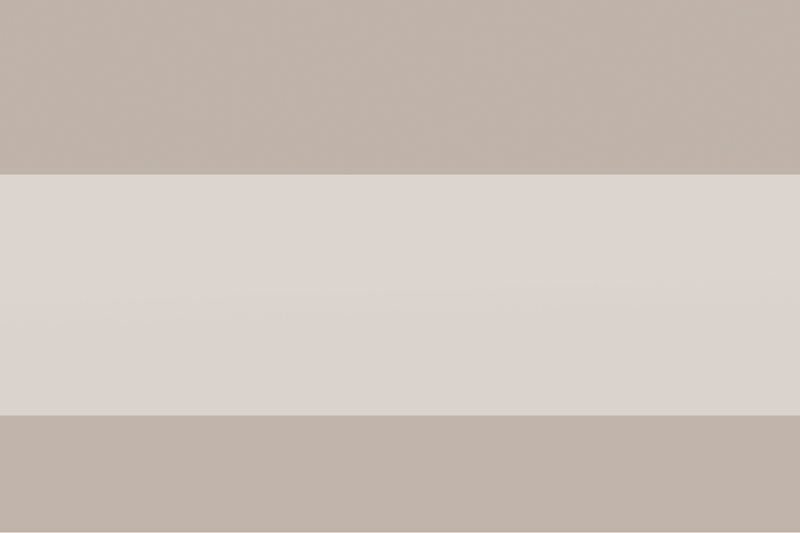 I asked innocently, knowing instinctively that I was the one being addressed. Then I remembered... Most wolves didn't like the eerie shifts in the ground that I caused. "You misunderstand me... Hasn't Soul Render told you? I use the ground, and the life that it supports directly, to see." I allowed a thin smile to pass along my face, drawing back on powers so that merely indistinct pressures showed me where everyone was placed. Trigiadea snarled. "And yet you wish for us to accept you here, as an enemy of sorts? Your freinds seem to be more inclined towards a fight," she said. "Or can you not read their body language? You will never win against my family and friends, so you may as well not even try!" She clearly had had enough of these wolves already and that was a really bad thing. Soul Render laughed. "Of course they know about your little talents, Tirona," he mocked. "Do you really think I would be foolish enough not to tell them about that, little puppy?" "Leave her, out of this, Soul Render!" Trigiadea growled, and several others behind her growled as well. She knew she was playing with fire at the moment, but there was no chance she was going to be defeated by mere words. She knew they would have to strike fast if it seemed as if these wolves would be a threat in time. I smiled mildly at my father, though on the inside I was laughing my head off at him. Little talents? My father hadn't kept such a sharp eye on me as he should have, it seemed. My talents were far from what they had been when I was a pup. Hopefully then, he and his new allies would underestimate me. I would give them no reason not to, till I was sure we could beat them. As I contemplated this interesting little revelation, a dark brown wolf landed beside me, his paws kicking up small bits of sand as he landed. He immediately collapsed, effected strongly by the increased gravity. I'd let him figure out how to compensate on his own; my young cousin needed the training. I landed with a heavy thump, my wings folding up. Something was wrong though, and I realized it as my legs gave out beneath my weight. I growled, realizing that something had shifted the land's pull. I recovered, though slowly, choosing to sit rather than stand. My older cousin was seemingly unaffected though, as was my younger aunt. I growled inaudibly as I recognized Soul Render, and registered the hostile language of the strange wolves. I wondered where my father was in all of this; he seemed to love this sort of thing. I sighed inwardly, before carefully memorizing the scents of each new wolf, as well as noting their particular markings and mannerisms. No point in not doing so. If nothing else, my siblings and mother would be interested to find out about the intrusion while they traveled back with my mother's new-found mate. "You really should go away, you know." I said amiably. Despite the pounding wells of fear and rage and illusions of pain that emanated from the strange wolves, I was rock-hard, blocking it out, leaving my mind a blank slate. I'd learned this skill early on, thanks to the abilities my mother had developed, to read wolves' minds to some degree. These wolves were a thousand times stronger than she was, but I could manage... For the moment, at least. Silent tendrils wrapped around the earth as it squirmed and choked, attempting to escape from the wrath of death. Its gripping tore at the very heart of the terrains, pulling them together and apart as the wind changed and as they changed. Change was always among them, and it fluctuated with age and difference in circumstance. Power made certain creatures hungry to dominate and kill the weaker of the species, but constant were the tides of her soul, even with the immense power that mortals could only dream to obtain in their life. It was rather odd how as the days passed and the seasons changed - why had not the gray hairs of life grown upon her ebony pelt? Why did she not feel the creak of old age upon her? Why did her eyes seem to stay the same, reflecting the same light as always? Sighing, she looked down to the three pups that traveled beside her. The others were staying with their father while she made her journey to the terrain of peace. Coming to a slight incline that she noticed her pups could not walk up by themselves, she manipulated the earth to make the region more flat and better to walk. Many a time, if they had become tired, she would summon water to quench their thirst. Or if they were cold, she would summon fire to help them endure the cold...it would be the wind if they were too warm. Yes, it was the much envied true elemental of the wolves, who knew the powers of earth, fire, water, air, and shadow. Nochturnea was tiny but had the most beautiful pelt of a night sky that echoed throughout the lands. Only did her mother know that she had the power of water and lightening, much like her father and of herself. A gentle soul she was, as did her elements suggest. In many respects, she found the child to be most like herself and the one that she pitied the least. Her brother, Camaki walked beside her...and his mother felt horrible for him - he was cursed with illness. Upon his features was a natural scar that would plague him for the rest of his life. Like many others, he had a defect of life, and it would take a good friend to look past his sorrows. Even though he had the powers of fire, wind, and lightening, it did not mean he would be naturally liked. Iris' other child was named Sentara, who was a warrior like no other. He possessed all the power of both Iris and Tiam, and she knew he would help to save the world some day. When they arrived, everyone was fighting and it seemed the scene had gotten worse than could be managed. "Silence," she commanded to all as her thin form walked upon the soil, her heart rippling the waters as she looked upon them all. "We have come for alliance to Modet and his children and relatives. But shall I expose my powerful children to this fighting? Veyerni," she said, pausing as she smiled, already knowing his calling far before her arrival. "I could kill you with a shot of fire...or perhaps earth..wind...or water. So I suggest you shut up. Now," she said, looking to her allies with hope. Nala also came from the bushes with her six pups. It had been a rather large litter she had been blessed with, and all were colored beautifully. "The fighting will cease now, as Iris has stated. You should not be here, dark doers," said Nala wisely, choosing her words carefully to avoid being forced when she left the land. Soon, she would be coming into heat again, as most do soon after the children have come to the earth. Beside her came Modet, silent as his old age had made him. It wasn't that he no longer wished to do the correct and proper things - his age allowed him no more freedom than that of a newborn child. Death would soon come to him, and he would be taken from them all in a time of immense danger. Was it his death that was sparking this chain of events? Or perhaps, it was the death of the leader here...or of Snow Dawn. Those of old were perishing as quickly as they had appeared, it seemed, and the day that he had met his true love in the glade...well, it seemed like it was but a day ago. When his dearest Fosca had perished from falling from a ridge, it had seemed but a moment ago. And the pang in his heart still throbbed as he longed to see her in heaven...in the skies of perfect gold. When would he see his dearests again? Would they visit him in his dreams and make him less lonely? Two of his sons came to him, Harith and Curcio, and he was glad that at least they were thriving. Those of his first litter always brought joy to his old heart, as he was so glad they were donig well in these times of trouble. "Toralon," called the sire, hoping to draw his son near for a few last words before he joined his brother, mate, and daughter in the skies above. Harith and Curcio waited patiently beside him. I smiled as I saw Nala and her new pups, and quickly walked over to join her, my strong legs taking up the added weight with only some complaints. The new threat of this pack of wolves wouldn't stand a chance against us here, so I had little worry of an actual attack from them for now. Still, I didn't like the idea of Nala guarding the pups on her own, especially in the gravity shift. As Modet and two more of my siblings joined us, I made a slight bow to my aging sire. Another few wolves soon joined us as well; the deaf Keiria, her blue-grey coat shining softly, her forever still ears somewhat limp. Beside her was another one of her pups, Alona, a wolf with fur of grey and silver flames. I approached my pack's alpha, unworried as Modetar, Tirona, and Kuvvet kept watch over the enemies, each one edging their way over to join the rest of the family. "Yes, Modet?" I asked my father, speaking to him as a leader instead of a paternal figure. I had always done so since leaving behind the world of a pup, and by now it was second-nature to me. He was a leader first, and father second, in many ways. "Nala! Modet!” Sarabi ran over to them. She had wondered as to where they were, some of the strongest of the wolves of her homeland. There was so much to consider at the moment, and she knew she would have to talk with those of her pack before she decided anything nowadays. It was her job to defend Vernien En’ Seere, and she knew that there was no chance she would allow herself to fail when it came to that duty. She knew that her friends and family were counting on her, and that was certainly a giant number of wolves. She was overjoyed to see her favourite sister, and she knew that it was for a good reason that she had come home now. Sarabi looked down at the little pups and smiled. They were all very cute in their own ways. She knew she would always protect them. Eventually though she turned to glare at the dark wolves again, not entirely pleased that they still lingered here. They did not belong in her lands, and they would get out. When it came to Iris though, she was not sure what to make of her at all. That was a wolf that had her utterly confused. In the darkness hidden well away from any of them and in a way that none of the others could see nor sense her, a dark tann she wolf watched Nala with envious eyes. For long had she wanted pups of her own, but no brute had shown any interest in her. And yet here was her older sister, happy with six lovely little brats of her own, from someone she did not even know. The irony of the situation only fuelled her rage for those who lived in this disgusting land, and she knew that one day… she would have her revenge. It was as she thought about what had happened however that an idea started to fall. She noticed that one of the pups seemed to lag behind her siblings, and that Nala did not seem to take any notice that the little one did. How interesting. Maybe that was the one to take away from Nala. Oh what a blow that would be for her dearest sister. To have one of her pups stolen by the very one she called a sister. Zira knew that she must have that pup! Quietly, she left the lands, ensuring that she would not be found out. Trigiadea looked over at Iris. “It is nice to see you again, Iris,” she said, greeting her with a friendly little nod. Iris always seemed to stand on the right side of things, and that was something that she was quite pleased about herself. She eyed the dark wolves. “So will you leave now? You are outnumbered and every wolf here has something that they hold close enough to fight to protect. These lands will never bow to you, or to any other dark wolf.” This was not an easy game that she played, but she knew what she was doing. No one was going to pick on tose who were loyal to her, nor were they going to pick on her. She would always stand in the way no matter what the cost of doing such a thing might be. They were her friends, and if anyone wanted to take them out they would have to go through her. Luikawa might be missing, but she was more than a match for these fools. Or so she believed anyway. She knew her role here. 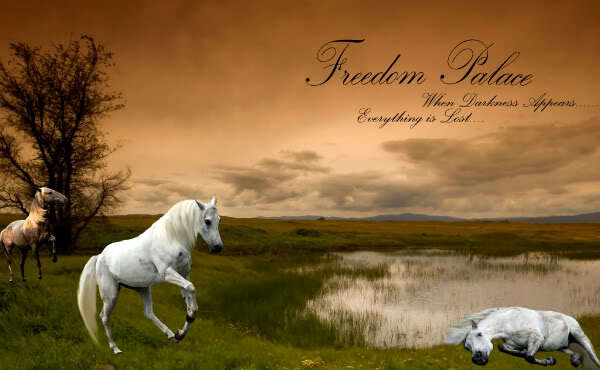 Together and united, the free, light wolves of Freedoms Palace would never surrender!